With Mother’s Day around the corner, families are preparing to celebrate the women who raise, care for, and sustain them. Yet most mothers, and indeed fathers, don’t receive the kind of workplace support they need to balance care for their families with bringing their full selves to work. As of March 2015, about 70 percent of mothers with children under 18 were part of the U.S. labor force, up from 47 percent in 1975. Despite this, many working parents lack access to basic workplace supports – only 13 percent of workers have access to paid family leave, while 11 percent are offered child care assistance, and only 6 percent have flexible workplace benefits. With more mothers in the workforce, but fewer families having access to the benefits they need to balance work and home life, it remains decidedly challenging to be a working parent. Disclose a detailed paid time off policy. Earn a top score for Paid Time Off on Glassdoor. Earn a top score for Work-Life Balance on Glassdoor. Provide flexible working hours or working hours that promote work-life balance. Provide day care services to employees. Have conducted and made public the results of an internal gender pay equity analysis. The companies – Adobe, Cisco Systems, Microsoft, NVIDIA, Salesforce, and VMware – have each made commendable strides toward building a more inclusive capitalism that encompasses the needs of working families. In addition to their strong performance on issues relevant to working mothers, their performance in the JUST Capital rankings is excellent overall, and all six have earned the 2017 JUST 100 Seal for America’s Most JUST Companies. It may not be a coincidence that all six are tech companies either – the industry is well known for offering generous paid parental leave in an effort to attract and retain top talent. 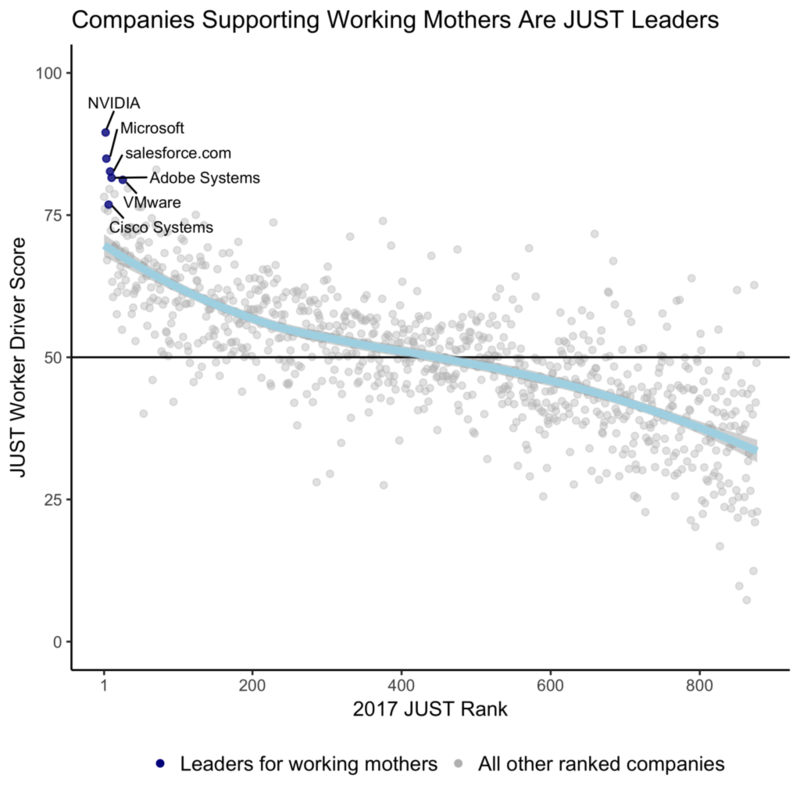 The efforts of these companies are moving the needle forward on establishing better structures for working mothers and families, and while the rest of corporate America is lagging, we hope to see many more companies offer programs and initiatives like these in the coming years. Since 2015, Adobe has offered up to six months of fully paid leave to new parents – starting in the U.S. and India (which make up 80 percent of the company’s workforce) and continuing to expand globally. Adobe provides back-up child care, tutoring and test prep, as well as access to adoption assistance that reimburses employees up to $25,000 for eligible expenses. For mothers traveling on business, Adobe provides breast milk delivery services that help employees overnight breast milk back home. Cisco offers unique paid leave opportunities for new parents, having established in 2017 a new global minimum of 13 weeks paid leave for new parents, as well as four weeks paid leave to supporting caregivers that can be taken flexibly over the first six months. Cisco also provides a host of childcare programs at their locations worldwide – from daycare centers to resources for in-home babysitting – and flexible work environment and systems, which allow parents to balance work and home needs. Microsoft offers 20 weeks of fully paid leave to all new mothers, and 12 weeks off to non-birth parents, including adoptions and foster placements. In the workplace, working families are supported by the Parents Employee Resource Group, a community of 6,700 members worldwide who provide resources, share experiences, and voice support for all types of families at Microsoft. The group hosts an annual Adoption Fair and Bring Your Kids to Work Day, integrating family planning and connection with the workplace. For fully-paid parental leave, birth parents at NVIDIA receive 22 weeks; non-birth parents receive 12 weeks; and all new parents receive eight weeks of “flex-time,” allowing them to more easily transition back to work. On returning from leave, working parents receive additional support through the company’s concierge service and caregiving resources. In the office, mothers’ rooms – which were designed by working mothers themselves – are available, along with expectant mother parking, shuttle service to a nearby health clinic, and an onsite therapist. Salesforce’s company culture is is driven by ‘Ohana,’ a Hawaiian belief that focuses on all the members and components of a family being interconnected. To that end, the company offers a variety of Parent Programs that support employees with or looking to build families. Primary caregivers receive 26 weeks of paid leave. Perks for parents include book lending to children under seven, access to breast milk shipping services for new mothers traveling for business, and college coaching for families navigating the college admissions process. At VMware, parents receive 18 weeks of paid family leave, as well as a $250 allowance to be used at their discretion when their child is born. The company also provides support to parents in the process of conceiving, with a new benefit that covers in vitro fertilization and egg retrieval, as well as surrogate pregnancies, up to $10,000. VMware’s working parent initiatives also incorporate Rethink Benefits, a program that offers resources to employees raising children with Neurodiversity issues like Autism, Down’s syndrome, and other developmental difficulties.